This is the last day to purchase The Kingdom of Thrim and get 2 bonus items. Here is a tweet that you could share for me. Click on the date or the picture and you will be taken to Twitter. OR Click on this link and you can use Facebook to help get the word out. The Kingdom of Thrim. You could also forward this email. 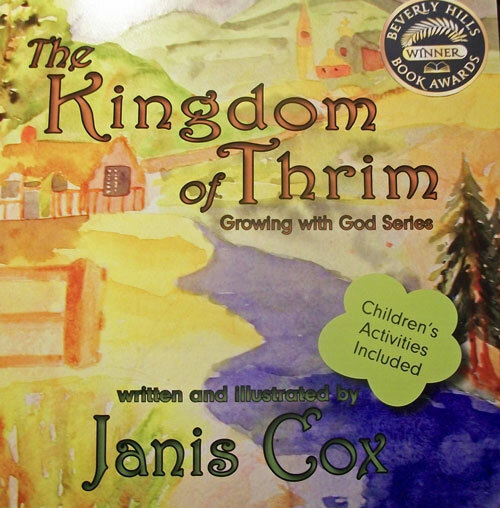 This entry was posted in The Kingdom of Thrim and tagged bonus items, children's book, Christian, prayer, The Kingdom of Thrim on June 28, 2016 by JanisCox. I am excited today to introduce you to my friend, Marcia Laycock. I know that you will find it fascinating how God has moved in her life. She is a prolific author, devotional writer and teacher. She is also warm, and caring. God has blessed her with an amazing way of expressing life through Him. 1. Tell me a little bit about your church background. How did you come to faith in Jesus? I was raised in a Catholic home but never understood what it meant to have a relationship with Jesus. I went through some nasty things as a child and decided God did not like me let alone love me, so I turned my back on Him by the time I left high school. I wandered in the wilderness for many years, ending up in a tiny town in the far north (Dawson City Yukon). You can read the full story on my website, but short version is, the Lord grabbed hold of my husband and me there, through the death of some close friends, and a “miracle baby,” in 1982. Within a short time we found ourselves at Briercrest Bible College, then pastoring a small church in Ponoka Alberta. The Lord led us to the mission field in Papua New Guinea in 1996, then to plant a new church here in Blackfalds Alberta, in 2005. 2. When did your interest in writing start? Can you look back and see God working through and with you in your desire to write. If so, explain your thoughts. I began writing when I was very young, mostly I think as a way of escape in a rather stressful home. God gave me some wonderful teachers who encouraged me to continue writing but it wasn’t until I finally yielded my life to Him that a burning desire was kindled in me to see my words published. I’m sure it was by His orchestration that I ended up in a province that had a thriving Christian writers’ organization (now called InScribe Christian Writers’ Fellowship). I joined that group in the early 90s, and was privileged to be on the executive for many years. It is my joy now to be able to teach and help others in their journey as they write for Him. 3. What is the best thing you have written? Describe it. Tell me why you think it is the best. (so far). That’s a hard question to answer. It brings to mind some devotionals that have had amazing responses from readers, my first novel, One Smooth Stone, which, through the Lord’s power, has changed lives, and even one or two of my poems. But If I had to choose I think I’d pick my current work in progress, a play called A Pattern in Blue, which is the story of my dad’s experience during World War 2. I was tremendously blessed to be able to work with the professional actors and a wonderful director at Rosebud School of the Arts and see that play read on stage last May, as part of the Budding Playwrights Festival. I am continuing to work with Lucia Frangione to expand and finish it and hope to see a full production of it some day. I think it is an important story that needs to be told. 4. What is your favourite scripture or scriptures and why? What is your thinking about memorizing Scripture? Do you have any tips for our readers on ways to memorize that work the best for you? I used to be stressed about trying to memorize scripture because I find it very difficult, especially since going through chemotherapy a couple years ago. But I have been amazed how God’s word simply floats into my mind – sometimes quite long passages – when I need it. There are a few scriptures that I would say are favourites – Hebrews 10:24, Psalm 103, Isaiah 43:1-7, and the whole book of Job, which, if I had to choose, would be my favourite. I had to read it all in one sitting, write a ten page paper and then an exam, all in the space of a week, while at Bible college, and it had a profound impact on me. 7. What new project/s are you working on? Why do they seem important to you? Are you compelled to write or do you need to find inspiration? How do you deal with interruptions? As I mentioned in # 3, I’m finishing A Pattern in Blue and also working on another play, as yet unnamed, for the Advanced Playwriting Course I’m taking with Lucia. This play is about a group of people who have come together for support. I believe it’s important because it’s all about putting our theology to work. The picture below should make you wonder what the play is about. I have lots of questions. Do you? I am also in the process of setting up my own publishing company, Small Pond Press and have released two titles so far – Abundant Rain Devotional for writers of faith and A Traveler’s Advisory, stories of God’s grace along the way. They are both available now on Amazon. As I mentioned above, as a pastor’s wife interruptions are constant. I’ve learned not to get stressed over it, to go with the flow and trust that God is working out my schedule so that all things important get done. Marcia Lee Laycock writes from central Alberta Canada where she is a pastor’s wife and mother of three adult daughters. She was the winner of The Best New Canadian Christian Author Award for her novel, One Smooth Stone. The sequel, A Tumbled Stone was short listed in The Word Awards. 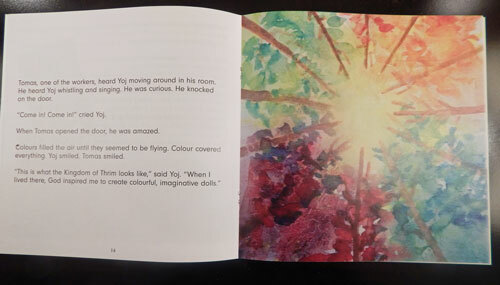 Marcia also has three devotional books in print and has contributed to several anthologies, including the Hot Apple Cider books. Her work has been endorsed by Sigmund Brouwer, Janette Oke, Phil Callaway and Mark Buchanan. This entry was posted in Interview, Thoughtful Thursdays and tagged anthologies, author, books, Christian, devotionals, Marcia Laycock, playwright, teacher on January 14, 2016 by JanisCox. Today is the Feast of the Magi or Epiphany. From December 25 until January 6th we celebrate the twelve days of Christmas. I have found this year that these days have been an amazing time of reflection and prayer. Today is the day we take down our Christmas decorations. We will think about the magi and their coming to visit the child – Jesus, bringing gifts and being in wonder of all that God has shown them. I don’t know about you but it was only a couple of years ago that I knew that the Magi did not arrive at the same time as the shepherds. Our Christmas pageants have made that connection and it sure fooled me. However, on reading through the Scripture, Matthew 2:1-18, it is very clear that they are two separate events. This week on my podcast at Hope Stream Radio I talk about the magi and what I learned from them. I hope you drop over to listen. You can listen directly to my podcast on my Page at Hope Stream Radio. Listen anytime – HopeStreamRadio’s unique programming loops continually throughout the day. My podcasts loop on Tuesdays. This entry was posted in Hope Stream Radio and tagged Christian, Christmas, Hope Stream Radio, internet radio, Janis Cox, living, magi, podcast on January 6, 2016 by JanisCox.